Keep your toys, potting soil, or even trash contained beautifully using the Mayne Berkshire Storage Bin. The classic styling of this unit enhances your garden or garage, while its versatility remains unsurpassed. 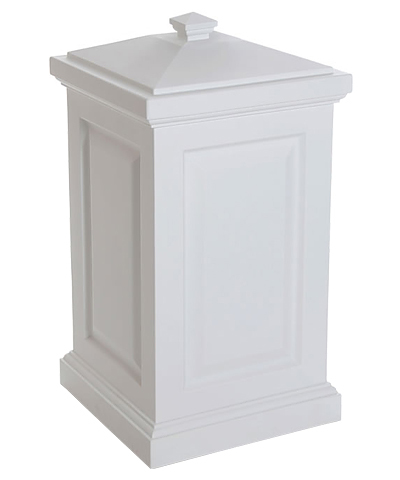 Its white color highlights any surrounding, and the stepped design on the base and top bring an architectural hint. This is furthered by the inset detailing on each of the four sides, as well as the pyramid finial on the top. The square column has a hollow center, making it perfect for holding pet food, mulch, or ice melt. The lid snaps onto the top of the unit, protecting the contents from the weather, and the polyethylene construction withstands the elements as well. Two included hooks attach to the interior of the bin, perfect for holding a standard trash bag. The flat base rests on a level surface, and the hollow column can even accommodate a 14.5" square, 30" tall vessel inside of it. Place a versatile container in your garage or at your door with this Berkshire Storage Bin. Made in the USA. Fifteen year limited warranty on bin, one year limited warranty on hooks.